Like almost everyone else I work with, I hadn’t been feeling well for the last week, I couldn’t seem to shake of a nasty cough and as a consequence I was little short on energy. Of course me being me I still managed three gym sessions this week but I just concentrated on lifting weights and skipped my normal cardio sessions. I’m fairly lucky where I work as we have a proper fully kitted out gym, complete with two full time gym instructors on hand, onsite and at a cost of only £10 a month. This means that I go to the gym in my lunch hour every working day of the week. Normally I lift weights on Monday, Tuesday and Thursday. On Wednesday I do a boxing workout with one of the gym instructors, who used to Box in the Navy and on Friday I either do a 4 mile run or I use all the cardio machines in the gym and work up a bit of a sweat. Anyway whilst we were warming up last night Graeme asked me what size belt I took and then proceeded to rummage around the store cupboard looking for a belt that would fit me. This obviously meant that we would be finishing off my green belt grading so I was now a little excited. As part of our warm up we broke down the components of Ippon-seoi-nage. With our partner we first worked on simply squatting down whilst Uke leant over us. Then as we stood back up we lifted Uke from the ground. Then we added in the entry and finally the breaking of the balance or kuzushi. Once we had practiced this several times we got the crash mats out and took turns throwing everyone else in the club. Graeme then mixed things up a bit in a bid to improve our spatial awareness. 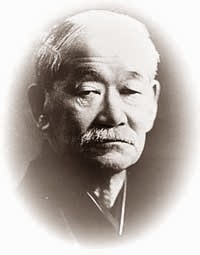 We would now have to first leapfrog over Uke, then do a forward roll before turning to face Uke, who had, following being leapfrogged over, followed closely behind you and then throw Uke with Ippon-seoi-nage. I was unfortunate enough to catch a stray foot in the eye whilst Big Stuart was doing his forward roll but no real damage was done. 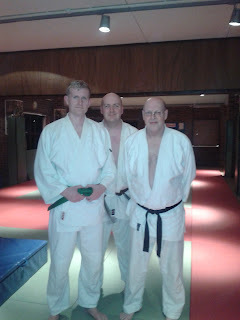 Once we had caught our breath I was informed we would finish off my grading and to start with I would have to do Newaza against Oli, Big Stuart and Peter for one and a half minutes each without pause. This went pretty well but I was starting to blow a little. Following the Newaza I was told to randori against Oli for 4 minutes and I would be expected to show combinations, counters, various grips and throws. Following my recent success with uchi-mata I decided quickly that this would be my go to throw and again it proved successful as I was able to throw Oli with. Graeme then shouted out to take follow the next throw to the ground so when I next managed an O-soto-gari I followed Oli to the mat where I held him in Kesa-gatame. We continued again and I think I managed another Uchi-mata and a Tano-otoshi. Graeme then told me to not use Uchi-mata or Tani-otoshi but to continue to attack using other throws. A Ko into O-uchi-gari followed and down went Oli again. Matte was called but then Big Stuart was sent on against me. At this point I was really blowing hard but Big Stuart was fresh and started moving me all over the mat which forced me to be a little defensive. Graeme shouted that I needed to attack more which I did but in the heat of the battle I was struggling to remember any other throws. Then I thought I would try Okuri-ashi-barai, even though I had never had success with this in randori. I closed the gap between Stuart and myself and was preparing to move him sideways so that I could sweep his feet and then all of sudden whoosh he was down but I had actually thrown him with Sasae-tsurikomi-ashi instead, which is even more odd as I’ve never even liked this throw in practice let alone tried it in randori before. I did manage a couple more throws on Stuart before matte was called but I was very tired at the end. We lined up as the class had ended and Peter called me out and told me to remove my orange belt and presented me with a nice stiff green belt. I certainly felt that I had earned this belt after weeks of technical grading and today’s randori.